How To Get There: Follow highway 24 south out of Buena Vista 8 miles to County Road 162 (Nathrop), and turn west (right). The road eventually turns into gravel but goes all the way to St. Elmo. Difficulty: Passenger vehicle accessible on well maintained gravel road. Private Property & Responsible Recreation: Many buildings in St. Elmo & much of the surrounding area is on Private Property. Venturing off of public roads and lands onto private land is trespassing. The surrounding mountains have miles of underground tunnels and shafts. The area is dangerous and a once safe and stable area can suddenly collapse. The buildings also are in various state of decay and are also unsafe. Obey any posted signs, travel & recreate responsibly, and always tread lightly. 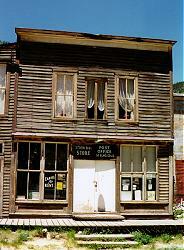 History of St. Elmo: Originally named Forest City, the US Postal Service complained of too many such named towns. Griffith Evans, one of the founders, was reading a book at the time titled St. Elmo, and hence the name was changed. Some historians claim the population was over 2,000 during it's hey day, but 1,000 is more accurate. The Denver, South Park & Pacific Railroad used St. Elmo as it's railhead, providing passenger and freight transportation throughout the area until as late as 1926. Areas serviced by the railroad included the thriving towns of Hancock and Romley and the line ran all the way through the famous Alpine Tunnel. 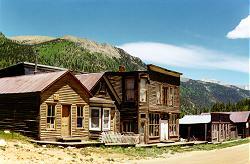 Today it is one of the most popularly visited ghost towns in the state, and is an official National Historic Site.